As a general angst continues to grip global markets (Are China and Europe headed for a recession? Are we facing a debt crisis? Is Trump not only guilty but insane? ), and while the world awaits the FOMC's rate-hike decision later today with a degree of trepidation, I want to briefly show some charts that suggest the US economy is doing quite well, actually. 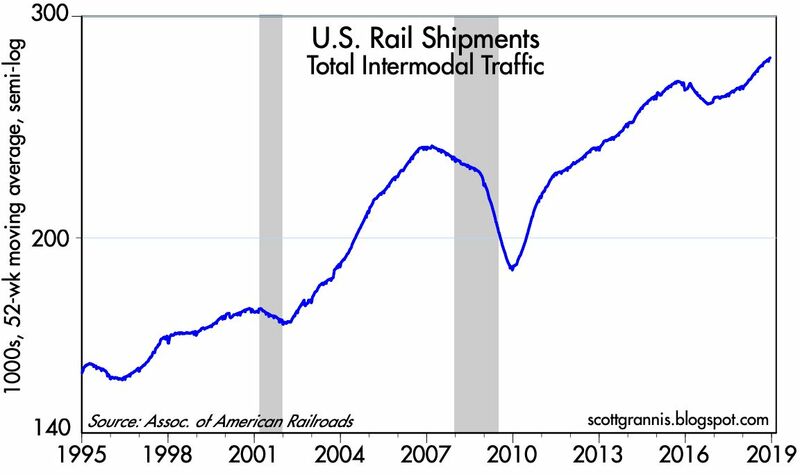 All of these charts measure recent, actual, physical economic activity—not surveys, not sentiment, not estimates. 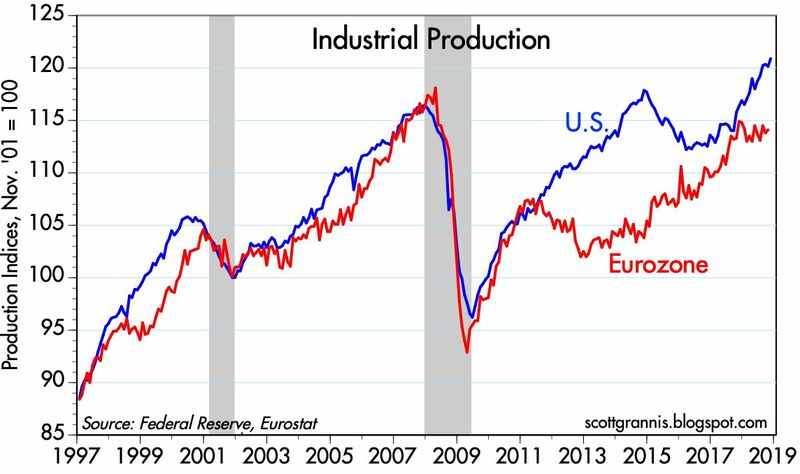 As Chart #1 shows, US industrial production stands out for its ongoing strength, a phenomenon that emerged almost immediately following the November 2016 elections. Eurozone activity, in contrast, has stagnated, and this jibes with the recent announcement by Fedex that its overseas earnings outlook has deteriorated significantly. There's little doubt the US economy is doing better than most others. 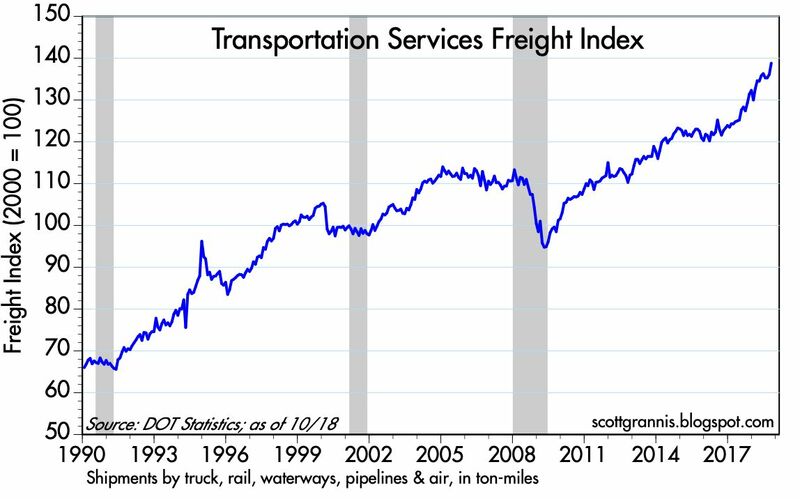 Chart #2 is a composite of truck, rail, waterways, pipeline and air freight shipments as of October '18. 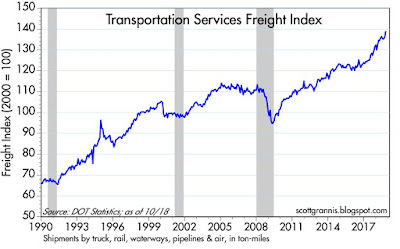 As with industrial production, physical shipment activity has surged in recent years. 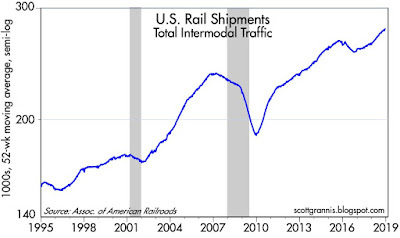 Chart #3 focuses on shipments by train, and includes data as of a week ago (btw, this does not include shipments of crude oil). Here too we see that activity has picked up in the last year or so. Chart #4 compares truck tonnage with equity prices. Here we see a dramatic divergence between physical activity and the mood of the stock market. 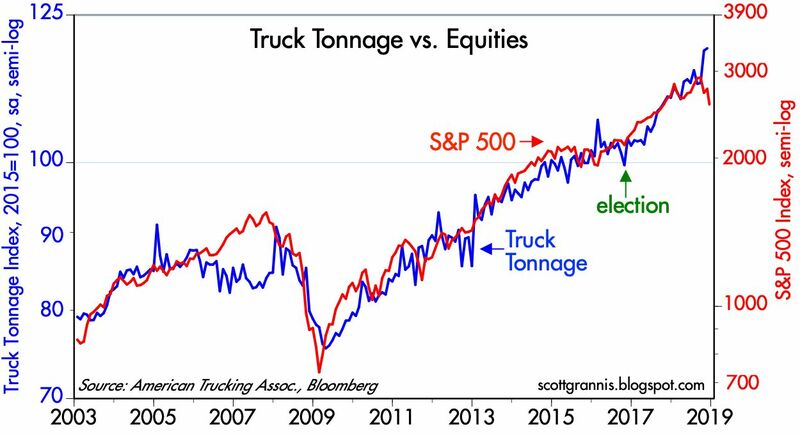 Financial markets appear to be completely out of step with the economy's physical fundamentals. The Fed agrees with you but I'm not sure about the market...Of course DT did himself no favors by literally giving the Fed no choice but to raise otherwise they would have looked obsequious. Pretty convinced at this point the markets angst is the imminent Mueller "reveal". And you'd have to a kool-aid dope at this point to not be at least damn worried. The brilliant and common-sensible Stan Druckenmiller wrote a recent oped in the WSJ and he also gave an extended interview with Bloomberg. He makes many terrific comments including several that get to the Fed's terrible policies. In any event, credit continues to deteriorate badly and breakevens continue to decline. Per the Fed, nothin' to see here, folks! pangloss is not a trader or a financial analyst. never has been. he's a conventional economist stuck in the world of charts. please stop hurting people pangloss. Looking at the first three graphs, it seems there was mostly an upward trend before previous recessions. That is, one would also conclude at the time that "everything is fine, looking at these graphs". Is my understanding correct? The market prices, for various economic sectors, are down significantly, a lot more than previous walls of worry. The markets might not be strongly efficient but surely they are not that inefficient? Is this some mysterious forced technical selling or is there another explanation? Someone has suggested this is due to hedge funds mania winding down. No idea how to confirm that with data. The fed raised rates, and even though they seem somewhat more worried they do not seem to understand the situation. Wouldn't it be reasonable to expect they would cause another mess like they caused the 2000 and 2007? I like the blog but you take inconsistent positions on Fed policy whenever the market tanks. See e.g. Your posts that QE was not necesaary until your positions in the market were threatened and then more recently your view that raising rates made sense as the economy strengthened until your positions declined and then you opined the the Fed should pause. Let's just be honest and admit you are subject to the same emotions that the rest of us feel, however irrational, during a market correction. More Fed destruction of markets today. Raising rates for the foreseeable future despite no hint of inflation. And the Vix actually fell as markets made an 800 point downswing. TLT rose 1.6% and poked above it’s downtrend. Orderly brutal declines with no hint of panic. Still no sign of a spike in the Vix/10 year ratio that’s accompanied every major bottom. Cash has been the way to go ever since Jay Powell opened his mouth in early October, right before election. Markets have never liked when DEMs gain power in Congress. Here we go again. With $7 trillion of global bonds sporting negative yields, and 90% of worldwide asset classes in decline (an all-time record) is there any good reason for the Fed to punish Americans in order to fight some phantom inflation that doesn’t exist? Why can’t we allow a whopping 3% gdp if there’s no inflation?? Powell couldn’t give a legitimate answer to a single reporter’s question...and markets plummeted the longer he blathered. Double barrel kick in the gut with rate hikes AND reversing monthly QE on “automatic pilot”. Now we bounce, and delay the enevitable pukeout bottom?? the people managing pensions need higher rates, they will get two more next year. fed knows inflation is not a problem, pensions, however, are a problem. Thank you for your calm head amongst many others who chase headlines as if they are universal truths. The fact that the market correction from early October coincided with the lows on the 10 year bond index is no coincidence - nor is it a coincidence that the 10 year bond index is now flat on the year - having being at a 4.5% loss in Early October YTD. Inflation? the supposed fear factor in October is now seen as "not a problem" all of a sudden - as the Fed scales back its concerns on that front but the risk appears to be that the Fed will "tighten too much" and damage growth. A cynic might suggest that if one were to ask the question Cui bono? from recent events, a number of highly leveraged bond funds who faced the risk of capital losses on their Treasuries and the ongoing risk of higher credit costs/funding costs and risks would be feeling far more comfortable that they would not be facing redemptions into 2019 now than they might have been 3 months ago. We are, once again being asked to believe that the only Assets that investors can "afford" to hold are US government debt instruments where - even if the Fed normalises the short end of the credit curve in the face of over 6% nominal GDP growth, the long end doesn't ever need to rise. Below is some insight from the folks in the fixed income dept. at Eagle Asset Mgn. You haven't posted your Corporate Credit Spread chart in about a month. Have things changed this significantly since then? Would appreciate your thoughts. "More worrisome for us are the signs from credit markets: Corporate bond spreads, both investment grade and high yield, have widened to their highest levels in years. We expect employment data to soften if spreads remain at these levels or continue to widen. Doors to the credit market have closed as new issuance has ground to a halt. Multiple deals have been pulled from the market due to what has been cited as unfavorable market conditions. In fact, the high yield market hasn’t had a single new bond issuance so far in December. If this trend continues through month end, it will mark the first month without a high yield bond deal since 2008. The month of December 2018 has marked the largest dollar amount of bonds downgraded from A to BBB since 2015. Several large companies are teetering on the brink of being downgraded to junk." Re "How do we fund IOER payments?" The Fed makes payments to holders of bank reserves by using the coupon payments it receives on the bonds it holds. Re: the generally disastrous market reaction to yesterday's FOMC rate hike and Powell's subsequent comments. For context, I recommend reading my comments on the preceding post, in which I argue that although the economy appeared healthy, the obvious signs of market unease coupled with the fact that core PCE inflation and forward-looking inflation expectations were below the Fed's target and falling, plus the fact that the market was telling the Fed that it should be scaling back its projected hikes, all argued in favor of the Fed pausing in December, and citing those facts as a rationale. Not only did the Fed not pause, but Powell made it clear that the Fed thinks the economy is very strong and thus further hikes are warranted. He made absolutely no mention of the facts that 1) global markets were wracked by increasing uncertainty, 2) inflation was below target and declining, and 3) the bond market had been substantially reducing its expectations of future hikes. He further indicated that the Fed's unwinding of its balance sheet was "on auto-pilot." This all showed a shocking disregard for the market's mounting level of concern and for the possibility that the economy could prove to be less strong than the Fed was projecting. In short, the Fed convinced the market that it was more likely than not to over-tighten policy, and that, in turn, raised the spectre of another Fed-induced recession. The Powell Fed has blundered at the worst possible time. If corrective action is not taken soon, there is likely to be more blood on the street. Scott....amen to everything you just wrote. Still cannot believe Powell actually used the term “automatic pilot” for unwinding on such an important day when he needed to prove his competency. Consumer confidence will be shaken with a 17% drop in the market in 90 days. Consumer spending forecast in trouble when looking at consumer expectations minus present situations index (now at -65), worse than last cycle. I don't understand Fed raising rates given that we're still below inflation target and at "bottom end" of neutral. The situation has changed quickly in 90 days and they are behind the curve. If they (Fed) start talking down probability of hikes in 2019, we might have a chance to avoid recession. Negative feedback loop solidly in place right now. To what extent is program trading contributing to the market turmoil? Good Post. For ten years the economy has been much stronger than people realized (and my 401K is thankful.) The Fed has been aggressive on rates, and may be overdoing it slightly, but the most interesting thing is how jumpy people are about the market. Concerns feel overdone, but time will tell. Re: "To what extent is program trading contributing to the market turmoil?" I have always had a problem with the theory that computerized trading can exacerbate market volatility. No one has been able to successfully "time" the market by selling high and buying low, but that is what would have to happen for computerized/progam trading to be successful. And to the extent you could figure out a way to mechanically sell high and buy low, by that very act of doing so you would be dampening market volatility. Those who sell when the market is falling can exacerbate downturns, to be sure. But to make money doing so you have to be able to buy before the market turns up. And that boils down to "sell high and buy low," which is everyone's dream but difficult to achieve in practice. What could be contributing to market turmoil is the ongoing growth in index funds of the ETF variety. If a fund faces intense selling pressure, the manager of the fund must perforce take action to sell portions of the fund's holdings, in order to keep its net asset value from deviating from the fund's market value. Lots of people could take the simple step of selling shares in a single fund, and that would translate into significant sales of all the stocks held by the fund. I don't think anyone has proved that this exacerbates downturns or market volatility, but we just don't have enough experience yet to know for sure. 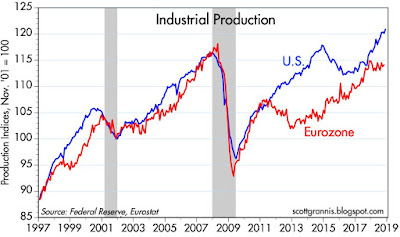 Re: "As Chart #1 shows, US industrial production stands out for its ongoing strength, a phenomenon that emerged almost immediately following the November 2016 elections." Why are you ignoring the amazing IP growth between 2009 and 2015, i.e., the index growth from 95 to 118 -- 23 point gain, versus trumps 7 point bump from 112 to 120? Why not look at the post recession gain 0f 30 points over about 10 years and not give all the credit to the current trump train wreck? These are excellent charts for tracking the current economy. from here before, so I decided not to! Two of your more powerful charts are the S&P 500 P/E ratio (P/E back to average) and corporate profits as a percent of GDP. During the Reagan "boom" the percent was 5, today it is 10. I would think that the market should have a higher valuation. Second, whatever the Fed is doing by raising the fed funds rate to slow the economy by raising interest rates isn't working. It has had the opposite effect on intermediate and long-term securities. Note the ten-year T Note peaked at 3.23 % and is 2.72% as year ends. The difference adds up to a 16% rally in those notes from the lows! The only entity getting squeezed are banks that borrow at the window.